Is it a good idea to use a partial denture? Partial dentures are often considered to be a less expensive solution for patients that have missing teeth. Their use is limited because patients need to have some remaining teeth in the mouth. Teeth, tissues and/or implant tissue combination are the things that support partial dentures. They usually come in two different versions – removable partial dentures and fixed partial dentures. The number of healthy teeth you have will help the dentist find out whether you will need fixed or removable partial denture. Removable dentures are kept in the same spot with the help of metal clasps that are tightened around existing crowns or teeth and they can easily be removed for cleaning and washing. On the other hand, fixed partial dentures are held in place with dental crowns placed over the remaining teeth or right under the gum with implants. There are many different materials used for the production of partial dentures – full acrylic, full metal, combination of metal and acrylic, thermoplastic nylon material etc. There are many factors that contribute to the selection of adequate material and the type of dentures is one of them (fixed or removable). 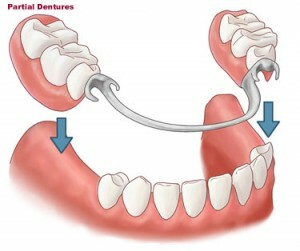 Generally speaking, removable partial dentures can be designed from any of the four aforementioned materials. According to many experts, the thermoplastic nylon material is the best option because It provides ultimate comfort because it is very flexible. The partial denture is made to protect the health of the remaining teeth and to save the proper structure of the mouth. People who miss more than one tooth will find eating and speaking much easier if they use partial dentures. In addition, partial dentures can help people keep the original shape of their face and stop the natural movement of remaining teeth. This moving leads to some serious health issues like headaches, TMJ and earaches. Fixed partial dentures are praised for their ability to make the replacement look more like natural teeth. However, this option comes with certain disadvantages too. For instance, they are costlier than regular removable partial dentures. In addition, this procedure requires cementing that will include parts of the healthy teeth too. The process of cleaning fixed partial dentures is more complicated and time consuming. No matter which option you choose, partial dentures will definitely improve the quality of your life. With a good dentist, you can expect to get dentures that will look almost the same as your natural teeth.